The wolf lopes toward her, his long legs gliding across the enclosure like a ghostly shadow. 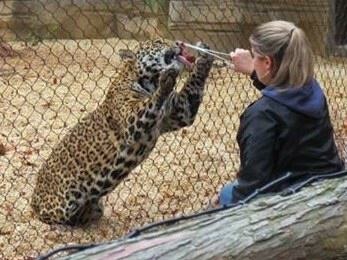 He skids to a halt, pressing the length of his body to the fence, tufts of his black fur protruding through the mesh wire. Erica Mueller, 33, cautiously reaches her hand forward. The wolf, Xander, drums his tail against the fence. A careful hand flattens against the mesh and then Mueller, blonde hair pulled back in a sensible ponytail, scratches the fully-grown timber wolf behind the ears. Xander’s tail wags even faster. “He could stay here all day,” Mueller says, laughing. As a zookeeper who specializes in predators at the Turtle Back Zoo in West Orange, New Jersey, Mueller cares for the resident wolves, big cats, foxes and bears. Also responsible for two red pandas and one groundhog, she and her fellow zookeeper, Tamara Myhal, feed the animals, clean their enclosures, and assist the veterinary staff. After six years of grabbing Amur leopards by the tail to practice giving injections, Mueller and Myhal have become very close. “We talk about all sorts of things throughout the day: family, friends, life in general,” says Myhal. Muller also finds new, creative ways of keeping the animals mentally engaged. She provides food puzzles and balls, blows bubbles for them to chase, and even plays movies, which they often show when the weather is poor and the animals can’t go outdoors. Yet Mueller provides far more than just entertainment. Beginning at 8:30 a.m., she visits each exhibit, checking to make sure all of the animals are healthy and safe in their housing. She then cleans the exhibits before letting the animals out for the day. Each morning, she scatters a mixture of fruits and vegetables around the bear enclosure. This way, the two American black bears, Jelly and Jam, can forage for their meals as they would in the wild. The red pandas, Sebastian and Jing Li, also eat in the morning, offered a large, leafy branch of bamboo. Like the wolves, the two cougars, Scout and Sage, were also hand-raised from an early age. While she didn’t personally raise him, Mueller considers Scout one of her favorite animals at the zoo, along with the wolf, Xander. While she says Scout is very friendly, she and Myhal still avoid contact with the cougars. “They’re still wild animals, and like domestic cats, they can be unpredictable,” Mueller says. Although she spends most of the day with wild animals, Mueller also passes much of her time with other humans. 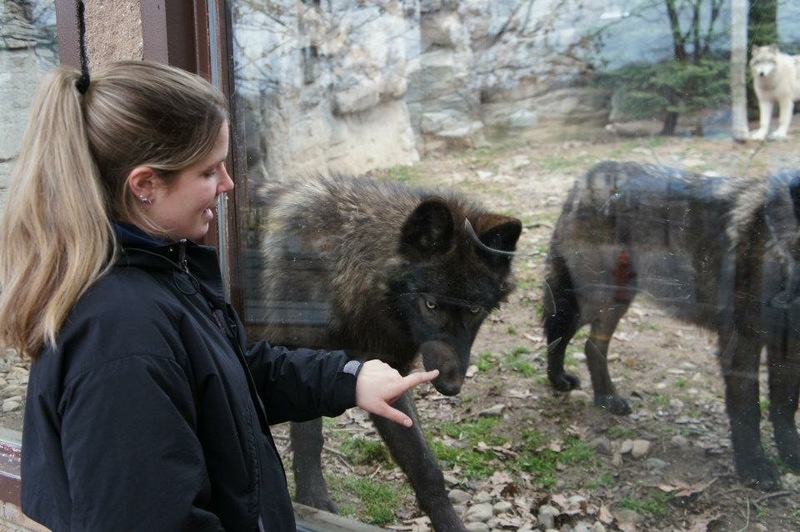 She and her fellow zookeepers serve as guides and educators for visitors, answering questions about the animals and the zoo. They also give presentations in the zoo’s amphitheater, exploring the animals’ physiology, behavior and ecology with guests. During the busy summer season, keepers may give two or three of these talks each week. “I’m not just a keeper, I’m also an educator and public speaker,” Mueller says. Mueller is more comfortable around a pack of wolves, having raised Xander and his pack mates Fargo and Theo since they were eight weeks old. However, guidelines newly adopted by the Association of Zoos and Aquariums forbid keepers from working directly with the wolves inside their enclosures. Both she and the wolves had to adjust to these stricter rules. “The transition was a little tough. I still wish I could go in with them. They are really social, so it was little rough when we left, but luckily they have each other,” Mueller says.